Thousands of Moldovan farmers have barricaded over 10,000 roads countrywide as they protest tax hikes on farm products and demand an increase in state subsidies. Activists threaten more protests if their problems are not addressed. Some 3,000 pieces of agricultural machinery were put to use blocking key motorways nationwide, as some 5,000 farmers brought traffic down until 11am local time (14:00 GMT), according to Alexandru Slusari, the Chairman of the all-republican UniAgroProtect Association of Agricultural Producers, one of Moldova’s four major farmers’ associations that organized the protest. "The rally started in the morning; by afternoon more than 10,000 roads of national importance have been blocked,” Interfax quoted Slusari as saying. Farmers have been asking state funding to the sector to double in 2015. So far the government has approved $400,000 in subsidies for 2015, while farmers demand funding in the agricultural sector to the tune of $800,000. They are also condemning the government’s plan to increase the VAT on farm products from 8 percent to 20 percent. 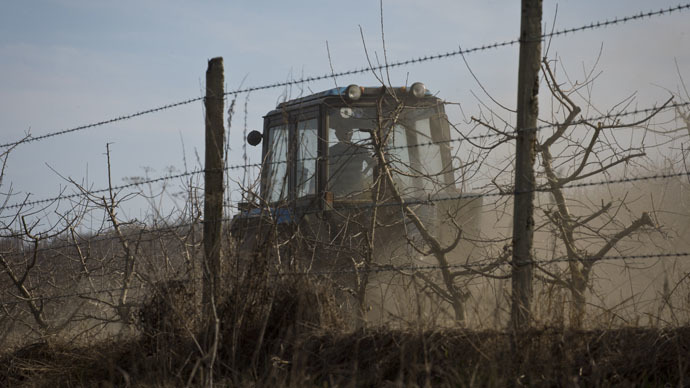 "Many farms in Moldova are on the verge of bankruptcy, while our appeals to the government were to no avail," TASS news agency quoted Slusari as saying. Farmers also seek financial help to all fruit producers, who mainly face losses after Russia last summer unexpectedly banned fruit exports from the ex-Soviet nation. After the introduction of the embargo on Moldovan fruit, tones of apples were left to rot in the fields as small farmers had nowhere to store them. They now also demand compensation from the government for the loss of the Russian market. “Those demands have been partially fulfilled by authorities, which is not enough for improving the situation,” Slusari said. Out of its annual production of 400,000 tons of apples, Moldova has "barely exported 4,000 to the EU, or more precisely to Romania. That's a miniscule amount," Slusari told AFP earlier in April. Before the embargo, up to 200,000 tons of Moldovan apples went to the Russian market. Additionally, the Moldovan leu has lost around 30 percent of its value since November, which made it tougher for farmers to repay bank loans, buy imported treatments for crop diseases as well as maintaining production in general. In late March, thousands of farmers already rallied across Moldova, just like this time. If the government keeps ignoring their calls, Slusari warns, more mass protests will follow. The next protest is tentatively scheduled on May 1, Labor Day. Moscow imposed the ban in the wake of Chisinau's signing of an association agreement for closer ties with the European Union in June, but lifted the embargo on an "experimental basis" for ten Moldovan fruit exporters. As estimated, Russia’s move has caused about $145 million of losses for Moldova, one of the poorest ex-Soviet countries in Europe, which relies largely on agriculture.